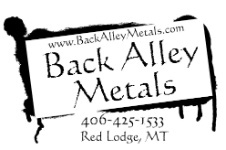 Please contact us directly, by phone 406.425.1533, or email, backalleymetals@gmail.com for your custom projects. Bear proof containers can be customized to suit your needs and include personalized artwork. Back Alley Metals is excited to announce we are now offering in house powder coating and sandblasting services. As always, we offer free quotes for powder coating, plasma cut art/signs, as well as measurements for railings, gates and custom work within an hour of Red Lodge. Need it shipped? no problem, we can arrange that for you as well. Whether you're after a small simple welcome sign, or a custom ornamental hand rail for your deck, give us a call and let us take your ideas and build them!